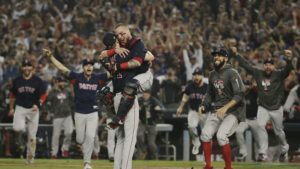 Boston is a championship town again as the Red Sox won baseball’s World Series Sunday night. With the city’s other pro sports teams (Patriots, Celtics and Bruins) looking good, Boston fans are walking tall. Let’s take a look at what else is happening in the sports world. The Boston Red Sox were the league’s best regular season team and dominated the playoffs as well. The boys from Beantown beat the Los Angeles Dodgers Sunday to secure a 4-1 Series win. 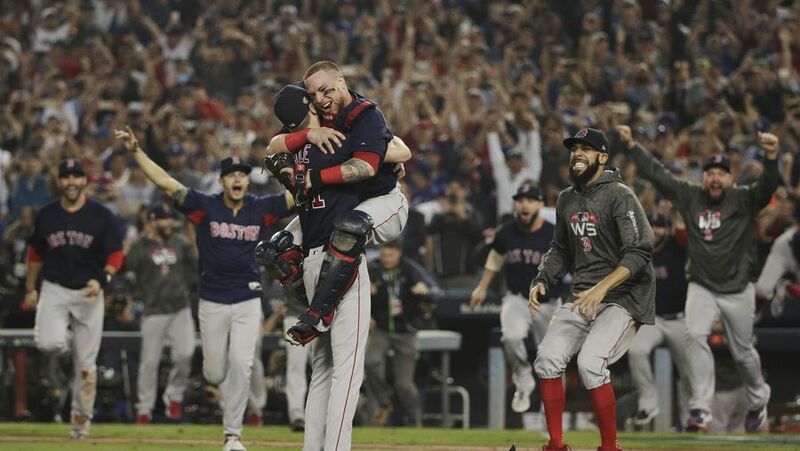 1) The is the Sox fourth World Series title since 2004. Dominance? Sort of. Boston’s last championship before 2004 was in 1918. 4) The victory parade will take place Wednesday stating at 11:00 am. See the route. Los Angeles dominance. 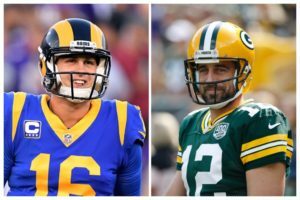 Even though their baseball team fell just short of a championship, LA football fans are thrilled as the Los Angeles Rams remain the NFL’s only undefeated team. Their latest win was a squeaker over the Green Bay Packers 29-27. The game featured a reunion of sorts with Packers former MVP QB Aaron Rodgers falling short to fellow Cal alum, Rams up-and-coming QB Jared Goff. Crumpets and football? The struggling defending champion Philadelphia Eagles look better after beating the Jacksonville Jaguars Sunday in London. The NFL has a new all-time points leader. The 45-year-old Indianapolis Colts’ kicker and four-time Super Bowl Champion, Adam Vinatieri, became the league’s all-time scorer Sunday. In a battle of elite teams, the New Orleans Saints traveled North and beat the Minnesota Vikings Sunday night. The week ended with Tom Brady and the New England Patriots dropping the lowly Buffalo Bills Monday night. Down and out in the ”Land.” It’s not a good time to be a Cleveland sports fan. The Cleveland Browns, 3-36-1 over the last two-and-a-half seasons under head coach Hugh Jackson, decided to fire their coach and offensive coordinator not even half-way through the season. This comes one day after the city’s pro basketball team dumped their coach less than two weeks into the NBA season. The weekend’s major upset was #6 Texas losing to unranked Oklahoma State 38-35 Saturday. With the loss Texas is out of the National Championship picture. Schedule Alert: College football fans will be tuned in Saturday night when #1 Alabama, far and away the best team in the country, takes on #4 LSU. Break out the Miller. 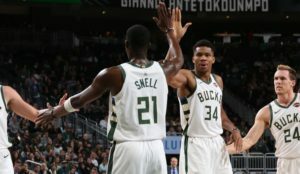 The NBA has only one undefeated team, the surprising Milwaukee Bucks (7-0). 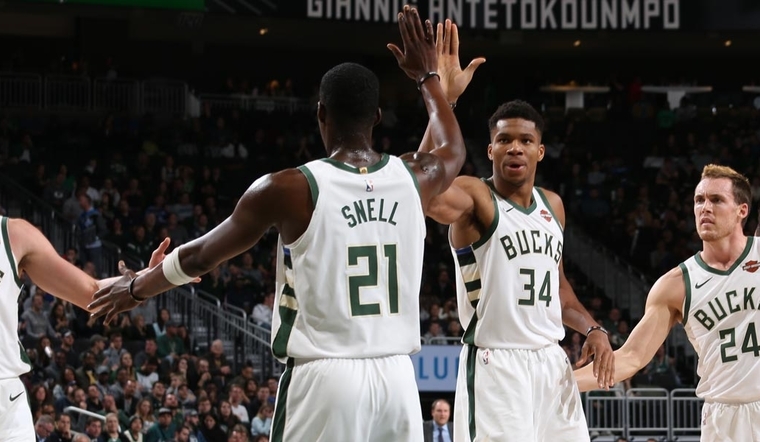 Monday night the Bucks beat the Toronto Raptors (6-1) who were also undefeated going into the game. On the other end of the spectrum, Cleveland Cavaliers coach Tyron Lue was fired less than two weeks into the season after posting an 0-6 start. Lue won an NBA Championship coaching the Cavs and star player LeBron James just three season ago. “The King” took his talents to Los Angeles Lakers over the Summer, however, and Lue was left with an empty cupboard. Raining threes…Golden State Warriors guard Klay Thompson drained a record 14 three pointers Monday night in a Warriors win. He rested most of the second half and ended the game with 52 points in just 27 minutes.